Back in early March, sources of ours informed us of a plan by Verizon to re-validate employee corporate discounts on or around April 1. The website for this renewal process is now live, so if you are currently receiving a discount on your Verizon bill from your employer, you may want to give this a look to see if you need to renew (re-validate). This is the first time in years I can recall Verizon checking employee discount eligibility, so there is no telling what your current status is. To check on your status, head over to this link. From there, you will see two sections that you’ll need to visit. The first, provides you with two options for renewing: either by validating work email address or by paystub. For now, you can skip by this section and into the “Check My Validation Status” area. There is a button that will open a new page with instructions on how to check your status. 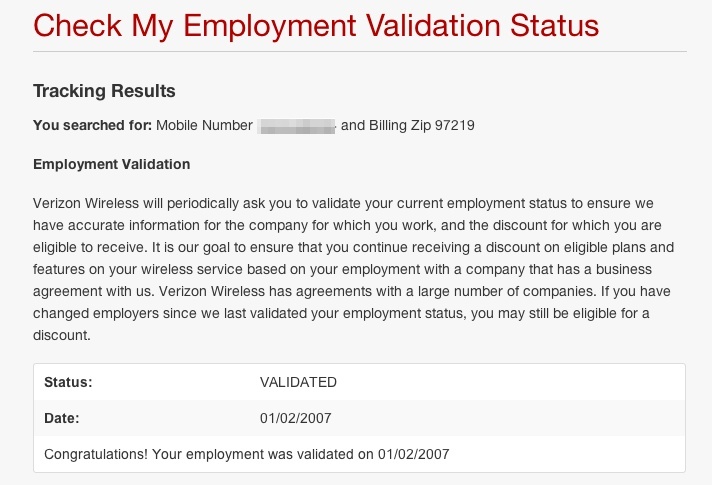 If your status comes back as “validated,” you may be able to sit back and continue enjoying your discount – or until Verizon tells you to validate again. In the end, Verizon is going to notify you if you need to renew. So if your status says that you are currently “validated,” there is still a chance that they will ask you to renew within the next couple of months. If you are on Big Red’s list, you’ll hear via email, SMS, and/or direct mail.